Donovan Boyd Sr. (The Marketing Coach) is a passionate, hardworking, attentive business man and the CEO of The Boyd Group LLC. Donovan a qualified Marketing Coach and professional. 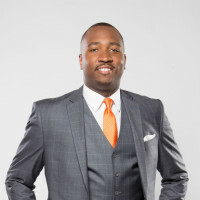 Donovan holds a bachelor’s degree in Business Administration with a concentration in Marketing, with a specialization in communication and media studies, as well as an MBA from South University. His professional background consist of 9 years of Marketing and Brand Management experience in the following industries: Education, Music, Entertainment and private consulting. Prior to starting up The Boyd Group, Donovan served as an intern in the urban marketing department for Atlantic Records. Donovan was a volunteer coordinator for Russell Simmons’ Hip Hop Summit Action Network. He spent 2 years as a Marketing Director for a local charter school in Cleveland, OH while maintaining an Artist management and promotional company for 4 years. Donovan holds the title of Marketing Supervisor for Caesars Entertainment. “Donovan has a passion for marketing and helping his clients see their dreams become reality with their businesses. As a marketing coach, Donovan wants people to understand the importance of brand development as it pertains to their business and it’s his mission to do so. Donovan’s passion is to travel the country to educate people on the growth opportunities within their business. Through Donovan’s varied background, he has set the perfect foundation for effective branding and marketing as “The Marketing Coach”.